I'm a bruised up mess, guys. I tweaked something in therapy and now whenever I use the foot I get black and blue marks all over the inside of my ankle. Nothing is torn and the x-rays look a-okay but it is so frustrating because just a month ago I really was on my way. So much so that I thought I could break out the bike again and start getting back my biker muscles (oh how I miss you, defined legs). Boot and crutches are back in my routine and I'm working hard to slow down a bit and let myself heal. So here is my monthly Secret Recipe Club culinary lifeline - an easy bread recipe that incorporates my favorite ingredient ever, caramelized onions. I probably could eat caramelized onions plain for the rest of my life, but I would break more bones since there is not enough vitamin D in that meal. Oh well, I'll stick to burgers and sandwiches and everything else I can squeeze it into. Like this bread. Oh my god, this bread. This month's recipe comes from Amy at Amy's Cooking Adventures. She is a stay at home mother who started learning how to cook when her kids started eating with her. In addition to her ridiculous skills with sweets she has impressive array of breads inspired by her grandmother, the baker of her family. As I have no yeast bread recipes on here and want to start exploring different types of flour, I decided to tried out her Caramelized Onion Bread. I switched out the canola oil for bacon fat because I can't leave well enough alone. A little thyme added to the onions made it a little reminiscent of the flavors I love in french onion soup. To echo the richness of that soup, I replaced some of the water with half and half. Because standing for a long time isn't the best thing for me, I used my stand mixer to knead for me for about 8 minutes on medium low, finishing the job on the counter. Slowly caramelize the thinly sliced onions over medium low to low heat in the bacon fat (or butter/olive oil/canola/whatever you like), ensuring the onions first become translucent and then developing a deep caramel color over 15 to 20 minutes. In the last five minutes, add the dried thyme leaves. Let cool. To prepare the yeast, combine with the honey and 1/4 cup of the warm water. Let sit for five minutes, until bubbles begin to form. Add the rest of the liquids, 2 cups of whole wheat, and 1 cup of AP flour. Mix until combined and then add the final cup of flour, onions, salt, and pepper. Knead for about 8 minutes in the stand mixer, gradually ramping up from the lowest speed until about medium low speed. Take it out and flour the work space with a little more whole wheat flour, knead for another few minutes to finish it off. Lightly grease a bowl, plop the kneaded dough in, and cover with a towel. Let rise at room temp for about an hour, until it doubles in size. 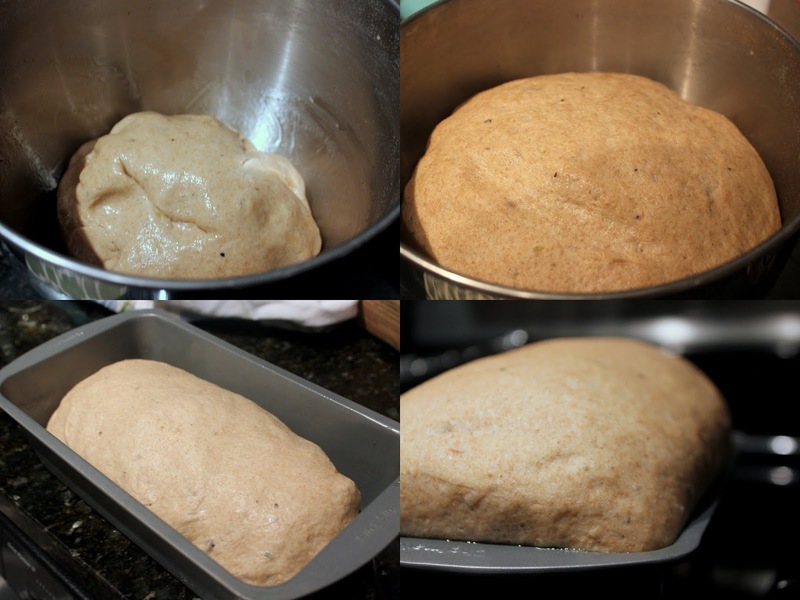 Take it out and form it into a loaf shape for a standard loaf pan. Cover with a towel and let rise for another 45 minutes. Preheat the oven to 350 F. Bake the twice-risen bread for about 45 minutes, until the loaf sounds hollow when knocked on top. Let cool, slice up, and enjoy! I love making bread and the addition of caramelized onions sounds great! Wow! That does sound like a yummy take on fresh bread. I adore caramelized onions on a sandwich... but in the bread sounds even better. I might just put together a killer grilled cheese with this stuff. Great selection! Mmmm - I am totally craving this bread again! I love all of your adaptions and your loaf look beautiful!! Caramelized onion bread sounds awesome. And substituting bacon fat was genius :) I am sorry for your weird bruising going on... I hope you're back to 100% super soon! We will just love your Caramelized Onion Bread, it looks awesome! That's some beautiful bread! Nice choice --very different. Hope you're recovery improves! Caramelized onions and bacon fat? I don't think this bread could get any better than that! Mmmm! The height on this loaf of bread is phenomenal! The idea of caramelized onion flavor has sold me ... I just bought new bag of flour and a big bag of sweet onions ... be still my heart!